Very mixed European with plenty of locals camping too. Time travel - this is back to how camping at a race might have been 20 years ago. Access by car and on foot varies according to if the track is open. 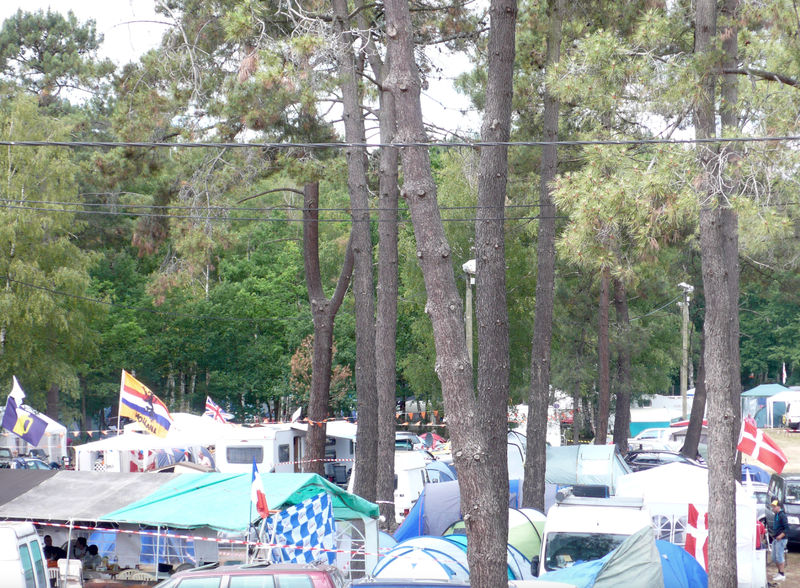 Campsite is not officially open until Wednesday of race week, but early arrivals common. 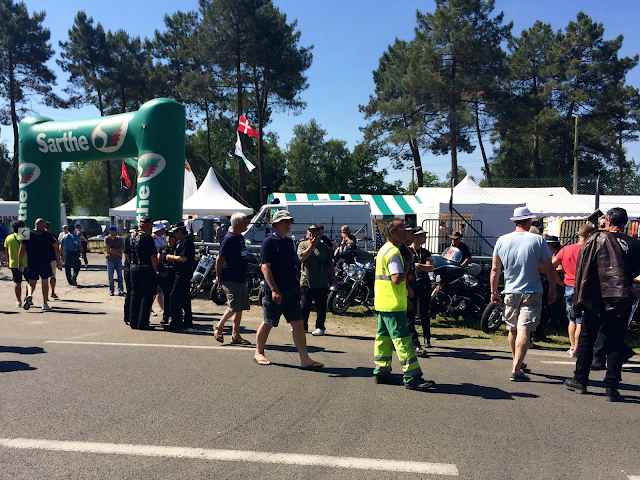 Situated at the farthest point from the start/finish line at the bottom end of the most famous part of the track, Mulsanne is a relaxed proposition with excellent track viewing potential, catering for camping and camper vans, with toilets and showers. This is very much a Marmite campsite. On paper it is miles from anywhere and has no marked spaces with late opening. But this isn't the whole story. It has a unique feel of old school camping and a shaded woodland location. Good ground and natural shade, close to Mulsanne village. Carrefour supermarket 10 minutes walk. Great trackside viewing, especially at night. Distance to the pits, grandstands and village. So far away it has different weather! Spaces are unmarked and the site gets quite full so not ideal for late arrivers. Limited water points and sanitation. Maybe a 5 minute walk. Site busy with non camping spectators during the race. Mulsanne village has a reasonable supermarket, shops and bars all in walking distance from the campsite. Mulsanne now has its own festival on the Friday before the race with parades of cars, music and entertainment. The site does not open "officially" until Wednesday, but several groups arrived from Sunday onwards. 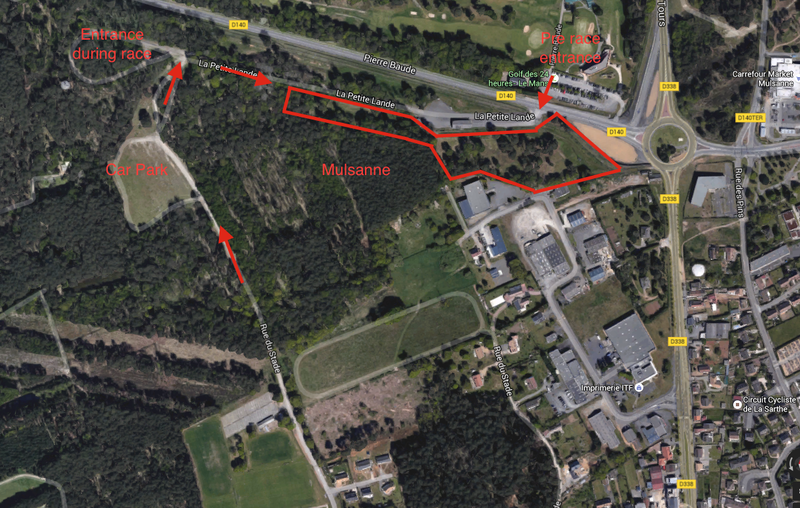 The access is via the weigh bridge right on the corner roundabout of the circuit until the race, when there is a pedestrian access from the village side and a carpark access from about 500m away. One of the delights of the site is its generally relaxed atmosphere and mix of nationalities. Sadly (like most campsites) there are now a few groups who delight in all night music and its pot luck if they are next door. This got so bad in 2014 that I went back to MB in 2015, but on reflection, I think this was partly down to choosing a pitch in the area close to the entrance. When I use this site again I will choose to be further back for peace and quiet and have a slightly longer walk to the bank. There are no allocated pitches and the security rely on you to find a spot amongst the trees that equates to the number of camping tickets that you own. As you enter the site the main area is in front of you, but you can also choose to turn right (pass the weigh bridge building) and enter a woodland glade. This place is quieter but further from the facilities. 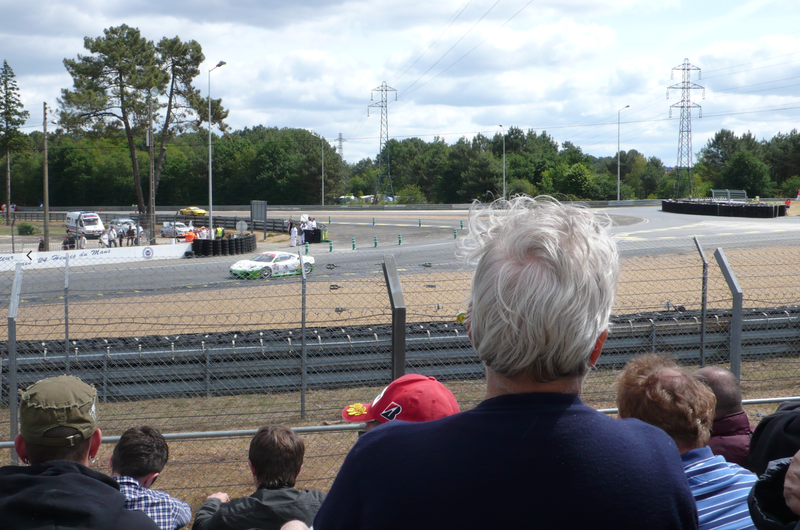 It does allow you to walk directly across to the track straight headed for Arnage though. This is less busy than the bank on the corner and a good view is guaranteed. The ground is generally well drained throughout and even with extreme weather I have not seen any serious flooding. 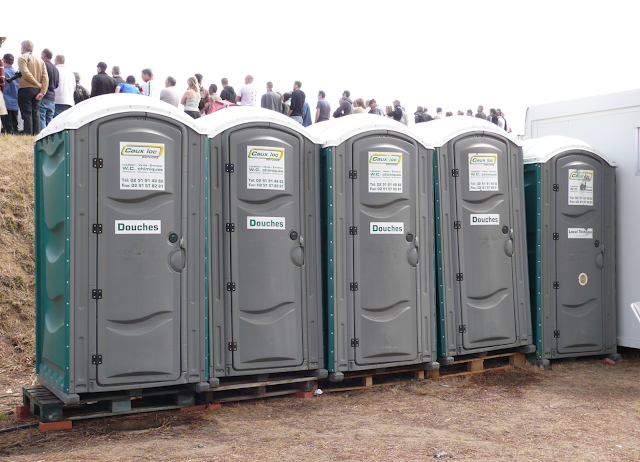 Next to the main bank there are a series of temporary toilet blocks, a medical station and gas heated portable showers. 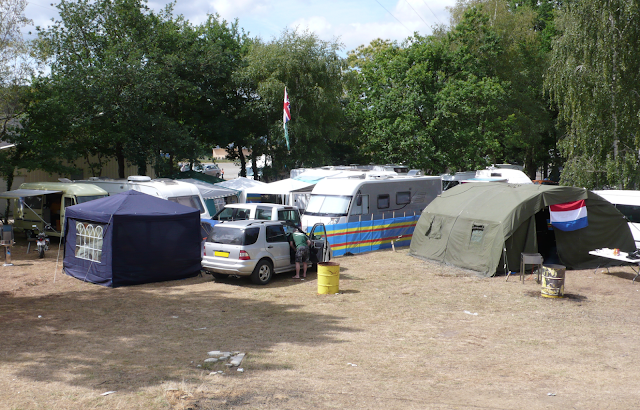 These are mainly clean and little used until the race when they are very busy owning to visiting non campers. They dont tend to take showers though! 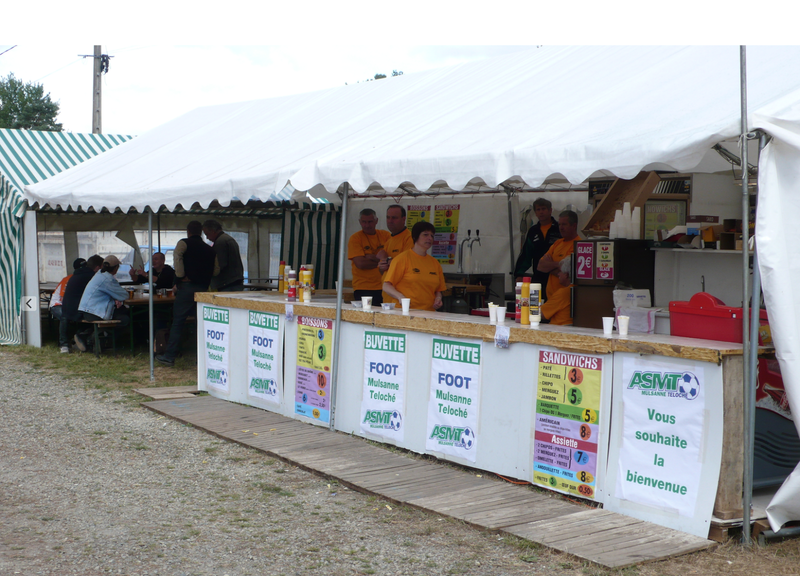 There is also a good temporary bar selling food and drink at the bottom of the bank. There are only two water taps on the site, so you should plan on carrying a roll type water carrier or jerry cans unless you have several hoses as the average distance might be 100m. One of the best things about the site for me is that the local Carrefour is a 10 minute walk, meaning daily resupply of produce without need to use the car (I am in a motorhome..). There is also quite a good bar serving food and a few minor shops. I have never had any bother with security, but I would not leave anything out at night during the race owing to the large transient population. I have a theory that because it is small and more used by locals than other sites, it might not be targeted by thieves as much - but this is just a notion. The chief ACO chap was very hospitable and introduced himself and told us to come to him in the event of any problems. The development of the local event on the Friday adds a nice sense of place and gives a carnival feel. If you are considering this site, I think it is a nice place to be, but at the obvious expense of access to the main circuit and village which are a long, long way away. When the roads are open it takes perhaps 25 minutes on a bike via the track, but with the diversions in place this is more like 45 minutes.